Just when you thought you’ve seen all the COARSE Omens, Thailands Tatao Kowin of TK Toyz has made minor adjustments to the classic 3.5″ COARSE Omen! And bless the Omen as a new pose makes the little chap even more adorable. Simple it may seem its pretty cool in our opinion. We can here other customizers think “what didn’t I think of that” as it is just adjusting the Omen legs but its change the appearance so much, CUTE! Right now it been left blank and we can’t wait for it to be painted up and see what Tatao comes up with. We do hope Tatao won’t be casting them in resin as that would violate COARSE intellectual property. 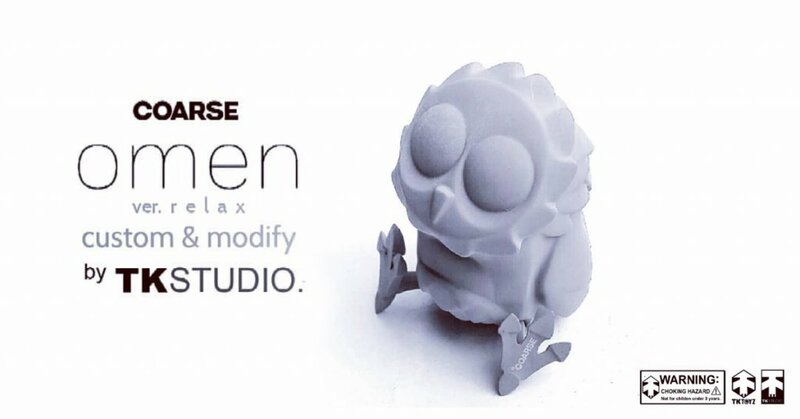 Nothing has been written about what the plans are and Tatao being a customizer we hope he will make a run of customs of Omen Relax that’s not a resin cast. We will be waiting for any updates on the project. Stay tuned for further updates. Keep up-to-date with all Designer Toy news via the TTC Mobile App. Available to download now via the App Store or Google Play Store. Find Tatao on Facebook and Instagram.